The 7th century monastic settlement at Scellig Mhichil, eight miles west of Kerry. The coming of Christianity to Kerry predates St. Patrick. In 431 Pope Celestine sent Paladius to meet the Christians in Ireland, recognising that there were Christians here before St Patrick, who came the following year. Christianity probably came to the south east at least due to the kinship with the Irish in Wales. The taken of hundreds of Christian slaves in Britain, such as St Patrick, also helped to spread the faith. St. Patrick was probably active in Northern Ireland. By the end of the 5th century much of Ireland was Christian. Apostle of Ireland, born at Kilpatrick, near Dumbarton, in Scotland, in the year 387; died at Saul, Downpatrick, Ireland, 17 March, 460 AD. He had for his parents Calphurnius and Conchessa. The former belonged to a Roman family of high rank and held the office of decurio in Gaul or Britain. In his sixteenth year, Patrick was carried off into captivity by Irish marauders and was sold as a slave to a chieftan named Milchu in Dalriada, a territory of the present county of Antrim in Ireland, where for six years he tended his master’s flocks in the valley of the Braid and on the slopes of Slemish, near the modern town of Ballymena. The Roman Christian Package – Christianity was part of a Roman cultural package. It meant the introduction of rectangular buildings. In the 5th century the holy men dressed in Roman style clothing (like priest’s vestments today). The chalice was another Roman style vessel. Wine was imported from the Meditteranean for mass. We also find Meditteranean pottery in the houses of the well off – did they control the importation or was it that were drinking it themselves. The marks on the edges of this pillar stone (left) are characters from an alphabet that was used in fourth-century Ireland. Known as ogham, the 25-letter alphabet was supposedly inspired by Ogma, god of eloquence. Ogham was carved and read from bottom to top. Ogham served as an alphabet for one of the ancient Celtic languages. Its origin is uncertain: it may have been adapted from a sign language. Current understanding is that the names of the main twenty letters are also the names of 20 trees sacred to the druids. A 15th century treatise on Ogham, The Book of Ballymote, confirms that ogham was a secret, ritualistic language. The majority of ogham-inscribed stones are found in Kerry and Cork, a 1945 survey recording 121 and 81 respectively, (also Waterford). This would appear to indicate that west Munster was the origin of the form. In Wales there are 15 ogam stones in Pembrokeshire, introduced by the Irish during their frequent raids there in the 4th and 5th centuries. In England there are 2 in Devon and 5 in Cornwall. Raftery  states that ogam writing was transferred to south-west Wales during migrations of the Dési. Ogam characters are also found on the Isle of Man and in the north and east of Scotland. It is generally held that the Picts learned the script from the Irish settlers in Scotland. Although the text on the ogham stones is in Irish, the alphabet is based on the Latin. The idea of erecting stone memorials comes from the Roman world. The inscriptions are usually the linerage of the dead. The ogham stones also acted as boundary markers, stamping ownership on the land. The ogham stone at Arraglen near Brandon (?) reads, “Ronán, the priest son of Comgán. Most ogham stones are found at church sites. In the Roman world most people were literate wheras in Ireland literacy was monopolised by the Church. The clergy wrote the history and they had great power. Up the 9th century they were writing in latin – after that they wrote in Irish. It was Irish monks who revolutionised writing. Up to 6th century all writing was in capitals, without breaks between the words and sentences. 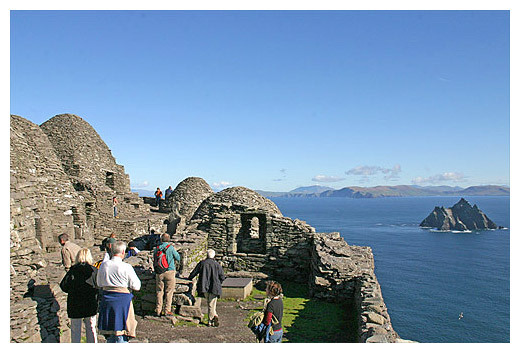 The Irish monks came up with the idea of upper and lower case and the use of full stops and spaces between sentences. The innovations in agriculture from the Romans include heavier ploughs, water-wheels and dairying, which became particularily important. This lead to forest clearance and expansion of agriculture. Horizontal water-wheels (5th & 6th century) are found throughout Ireland, particularily at Church sites. In County Derry was have an example of a tidal water-wheel. At this time we also see new metal working. For example the use of enamelling and filigree (threading). A new artifact that is also introduced at this time is the pennacular brooch, which was very much a Roman design. Other metalwork we see are buckets, pans and household vessels. We also see Romano-British glasswork. Ireland is now part of an international organisation, the Church.